Summertime can be a nightmare for women who suffer from hot flashes. The symptom is caused by hormonal changes, and it can also be aggravated by environmental factors, such as humid, sticky weather. Continue reading to learn more about how to manage hot flashes during summer and finally beat the heat. Don't feel like you have to avoid the sun completely just because of recurring hot flashes. As a matter of fact, sun exposure will do you well! For instance, sunshine helps boost serotonin levels in the brain, which helps alleviate other mood-related menopausal symptoms. Sun rays are also the best way to get your vitamin D for the day, which is essential for strong bones since it helps calcium absorption. Moreover, being able to relax with family and friends outside can improve your mood and provide you with much needed stress relief. 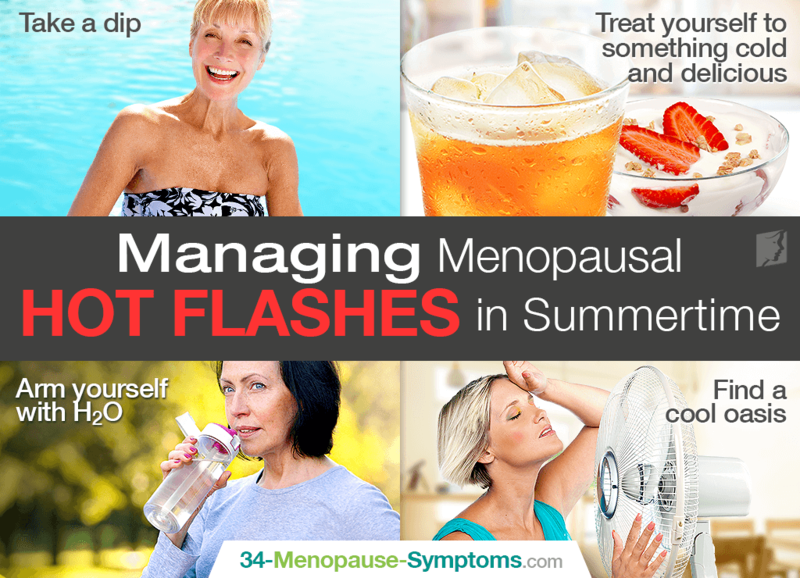 Instead of avoiding the sun, here are some useful tips to get you up and going with managing menopausal hot flashes during summertime. Grab some sunscreen and enjoy! No matter the season, swimming cools you down and gets your entire body moving. A few laps around the pool will work wonders for avoiding or relieving sudden onsets of hot flashes. Moreover, regular exercise increases blood circulation and reduces stress. If your swimming skills are not as strong, consider participating in water aerobics or renting flotation devices when you want to spend time poolside. Hot summer days call for cold treats such as frozen yogurt, iced teas, and shakes. Be selective when choosing your next summertime beverage as caffeine, alcohol, and sugar can trigger summer hot flashes. Order non-alcoholic, decaffeinated, low-sugar versions of your favorite frozen and iced options. Having a chilled water bottle in hand or quickly available in your purse is important to ward off hot flashes and other conditions triggered by dehydration. Drop in a few ice cubes to keep it chilled and fresh. If you're beach-bound, carry a cooler to keep your water icy-cold while you're out in the sun. Also, find reprieve with ice-cold washcloths fresh from the freezer. Place it around your neck for quick relief. When you're worn out from the sun, cool off inside. Find a special oasis with air conditioning or floor fans where you can relax while a hot flash episode passes or before one is triggered. If you're away from home, step into the nearest store for a quick break. Without a doubt, having to deal with menopausal hot flashes during summertime can be aggravating for many women. However, suffering from them does not have to mean you get to spend your summer inside. Follow practical tips such as taking a dip to cool off, indulging in cold treats, keeping water on hand, and finding a cool oasis. Keep reading to learn more about how to manage hot flashes during any time of the year, and finally get on the path to complete body temperature control.